Don't forget about writable volumes. Writeable App Vols can be useful and dangerous at the same time. Using them correctly can save you time, a precious resource few IT engineers have. I have been working with a large enterprise customer on the implementation of the Horizon (View) Enterprise Edition Suite. This version includes almost all of the products in the VMware EUC portfolio. It's been awhile since I had wrote anything on my blog. So I decided to take a look at what I have learned in the last six to nine months while helping my customer with this virtual desktop deployment. Most recently we have been working on the App Volumes product as it is the largest and most time consuming piece of the puzzle. My customer decided to bring in VMware Professional Services to help with this part of the implementation. Doing this they could leverage some real world App Vols deployment experience. My customer has identified over 400+ applications that need to be packaged and delivered to non-persistent desktops. VMware has multiple ways to deliver all of these applications. They could use an App Volumes App Stack, RDSH, ThinApp, or base image installation. The value of using an App Stack is the single instance storage of the application. The customer I'm working with today is planning to deploy 4000+ virtual desktops. Let's do the math for the storage required for a typical office application suite. I'll estimate the application install size at 4GB of disk. 4GB X 4000 Desktops = 15.6 TB. I'll let you do the math on how much your storage costs are for that. That's just one application. 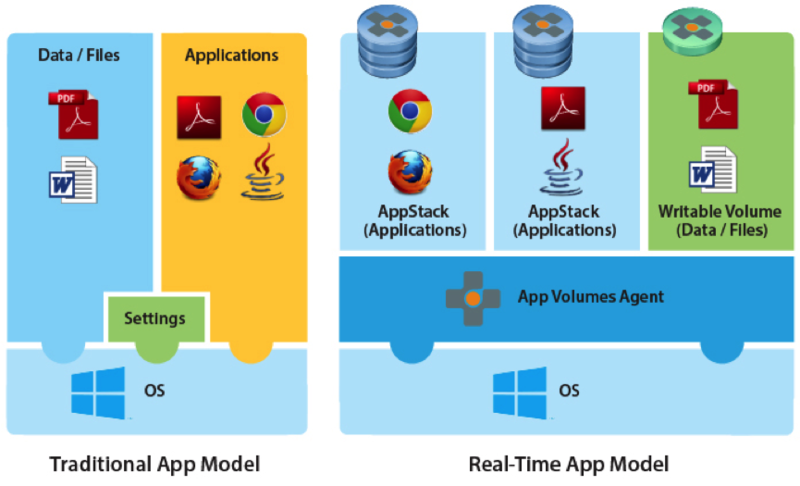 By deploying as many applications as possible into a single instance of an App Stack can save a customer a lot of money. The trick to packaging App Stacks is figuring out the common use cases. Not all 4000 users need all of the applications. Some applications have specific licensing requirements. And sometimes out of the 4000 users only one or two need a specific application to do their job. That's where writable volumes comes in. Our VMware Professional services recommended using the writable volume for these "snowflake" users that need one or two applications that are specific to their needs. My customer will give these snowflake users a writable volume and install these special applications they need manually. However be careful with the use of these writable volumes, VMware recommends you use them sparingly. The main reason for this is, Disaster Recovery. You need to consider how are you backing these up. How will you restore them? Are you using a cloud pod architecture? How will you replicate them to the other sites? Hopefully this helps you in your journey with deploying App Volumes in your environment.